Upon arrival in Duong Lam village, bike along tiny ancient alleys to visit Mong Phu temple in Mong Phu hamlet - the only hamlet whose original village entrance gate remains intact, dedicated to national heroes. 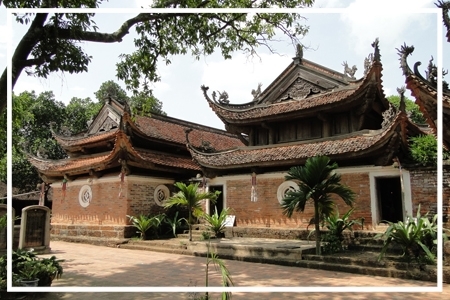 Continue riding around the village to experience the daily life and farming practices of Vietnamese peasants along the terrace, with a stop at two ancient houses; the biggest ancient house was build 200 years ago, and the most ancient house dates back to 400 years ago. We will then cycle to visit Mia Pagoda, built in 15th century. After lunch, we will visit the village of Bat Trang, Vietnam's most famous ceramic village, which is located along the banks of the Red River. Ancestors of today’s ceramic artisans began their craft in world famous Bat Trang during the Ly Dynasty some 10 centuries ago. Local artisans from here are renowned the world over for their ceramic arts and have won many international awards. This is a exciting opportunity to observe these artisans at work. Their refined ceramic masterpieces can also be purchased here at very reasonable prices.